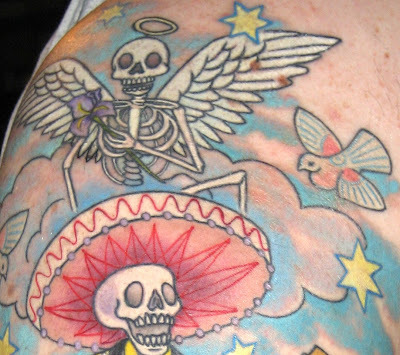 For those of you following Tattoosday, I am going to take a different approach to the blog in 2009. The concept will be the same, but I am going to enhance it a little bit. All posts will be dated and time-stamped around the time that they happened. So, if I don't get around to posting the ink for a few days, it will be back-dated for chronological effect. I also want to blog above and beyond the successes (i.e. the people who said "No") and expand to other tattoo-related topics, when they arise. For example, if I stop in Borders and look at a tattoo book, I'd like to link it here. I am hoping to turn all the "no thank yous" into items of interest. I also have a couple of new features in the works that I hope to unveil in the new year that will continue to make Tattoosday the interesting experience that I believe it is. In an effort to start out with a clean slate, I am cleaning out my drafts and posting all the remaining drafts I have in house, including several pieces by Jessica, who I met back in June. Once again I want to thank everyone who regularly reads Tattoosday, and those who visit once in a while. 2008 was a banner year, registering over 100,000 hits this year alone. I'm looking forward to seeing what 2009 will bring. Happy New Year! 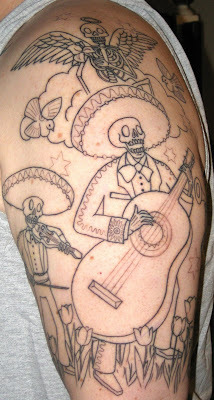 Here are some more tattoos from Jessica, who inked much of this work herself. She has over 50 tattoos, and has work featured before here. Thanks to Jessica for sharing all her ink here at Tattoosday. Here's more of Jessica's ink. 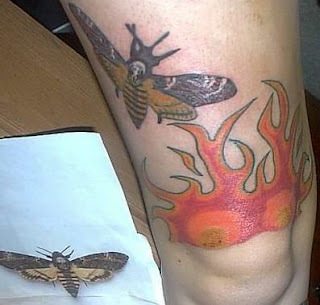 "Flames on my kneecap and the death's head moth from The Silence of the Lambs....."
which came to cultural significance when featured on the movie poster for the Jodie Foster movie mentioned above. 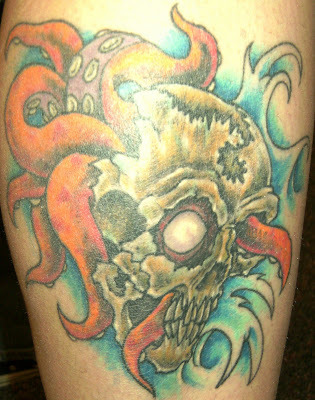 Thanks again to Jessica for sharing her ink with us here on Tattoosday! Here are the last two pieces I have on Jessica (I'm sure in '09 she'll send me more...). They are her foo dogs, which she has dubbed Moogoogaipan (named after the Americanized Chinese food dish moo goo gai pan) and Red Foo. Jessica has shared a lot of ink here. 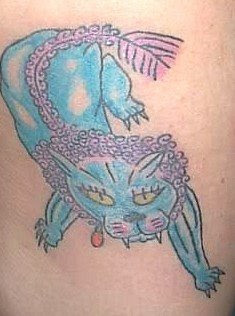 She actually has some other foo dogs in an arm sleeve (shown here) which are well worth seeing again. Thanks again Jessica! 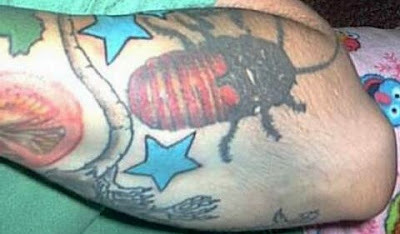 Earlier this year, I featured the first tattoo belonging to Paul, a co-worker and friend. 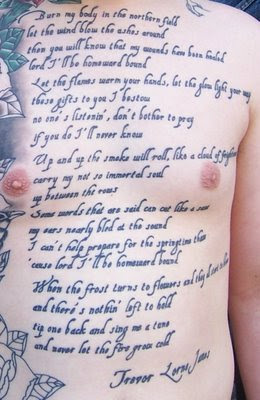 Later on, he showed me his sleeve (here). I am just getting around to show you his new work in progress, a cover-up of a tattoo on his right bicep, located above the first one of his that I featured here. This isn't completed, but it does display a stage of the work that is interesting. Documenting it now will make it more interesting when the piece is completed. That's an om symbol at the top of the piece. 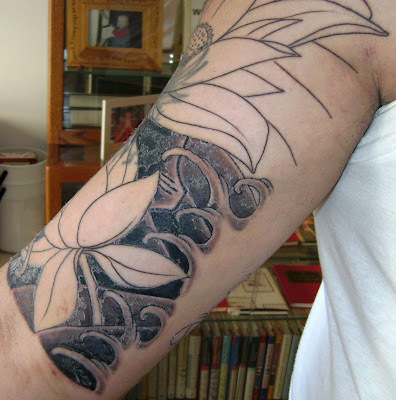 The basic design is a traditional Japanese half-sleeve. The work is done by Horisei at Chelsea Tattoo Company. Horisei inked my friend Rob's traditional Japanese tattoos (here). Thanks again to Paul for sharing his work in progress here at Tattoosday. We're looking forward to seeing the final work in 2009! I received a pleasant surprise yesterday, just before leaving work, when Brooke (see her tattoos here and here) introduced me to her friend Veronica, who was visiting her in the office. I correctly identified the tattoo, on the left side of her back shoulder, as the chess piece known as the Knight. 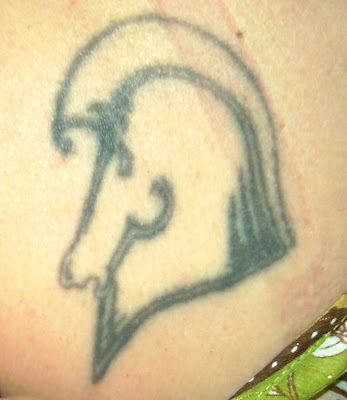 Although it is a horse, Veronica noted, most people who see it don't realize at first that it is a chess piece. So why a chess knight? 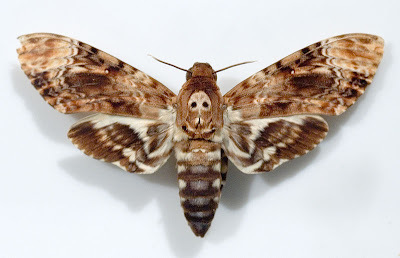 Several years ago, Veronica went on a date with a guy who had a similar tattoo. Not only had he been a chess player, but his nickname in the military had been "Crazy Horse". He had designed the tattoo himself and Veronica was drawn to it. She knew she wanted one just like it, but they both agreed, as their relationship progressed, that it would only be appropriate if they were married. Well, we all know where this is heading. When the time was right, Veronica's boyfriend didn't pop the question, he popped the suggestion, "Let's go get that tattoo". Which she did, customizing his original design by making it a little smaller, and adding a feminine curl to the front of the Knight's mane. They went to a shop on Broadway in Santa Maria, California. There are three shops currently on Broadway, so I can't give proper credit to the shop or artist at this time. The formal proposal came shortly after the engagement was "inked". Veronica married the man with the matching tattoo but, as life would have it, they split up amicably after three years. Her ex-husband-to-be told her that he wouldn't be offended if she decided to cover the chess piece up, but the thought never crossed Veronica's mind. She wasn't worried about future girlfriends (or wives) getting the same tattoo. She recognizes it as a unique symbol of a past chapter in her life of which she has little regret. Oftentimes, people are remorseful about their ink, especially when the piece is tied to a relationship that no longer exists. It is always nice to see a tattoo that holds great meaning, even while transcending a bond that has broken. So the chess piece remains, and we here at Tattoosday extend our thanks to Veronica for sharing this part of her personal history with us. 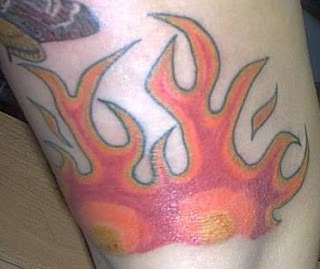 I'm particularly proud of this particular tattoo story because it hatched out of Tattoosday itself, in a roundabout way. The signature above is a freshly-inked autograph of a man who has been dead over forty years. It graces the back of Mary-Lee, who I have known and worked with for a decade. The signature is that of her father. 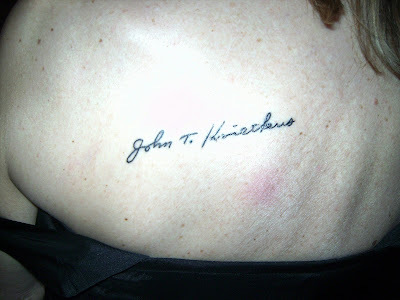 Earlier this year, Mary-Lee, who has regarded the Tattoosday hobby of mine with a curious amusement, was moved by the story of Kate's tattoos (here), especially the one of her twin sister's signature. Kate's sister had died in a car crash the previous year, and the name of her sister, in her own handwriting, is a touching and beautiful memorial. 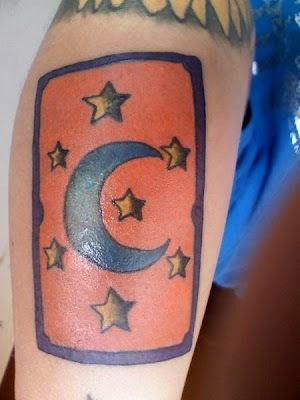 Upon hearing this tale, and seeing this tattoo, Mary-Lee began thinking of a similar tribute, made all the more remarkable by the way the stars lined up to make this happen. 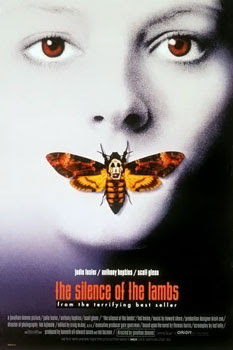 Her father died at the age of 53, when Mary-Lee was only eleven years old. She was a typical Daddy's Girl, and has never forgotten the sudden nature of his passing, and the absence of closure, as she was not allowed to go to his funeral. So, as the anniversary of his death approached on December 4, and she realized that this anniversary was special in that she is the same age as he was that he died, she decided it was only fitting to get her first tattoo, honoring her dad, at the same age as he was on the day he died. The final question was, would she be able to get it inked after 6pm on the anniversary? She doesn't know the exact time he left this world, only that it was after 6pm. She started looking for a reputable shop in the area, and stumbled upon Red Rocket Tattoo, located between work and her home in Manhattan. She booked an appointment after 6pm on December 4 with Betty Rose well in advance. 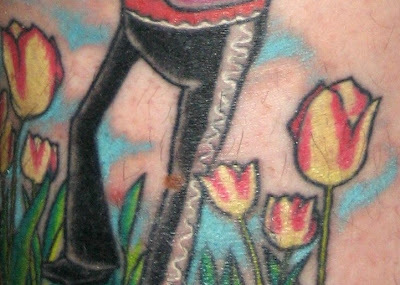 As if the kismet of the dates lining up wasn't enough, Red Rocket is where our friend and co-worker Paul (see his ink here) had his work done, and Betty Rose was the girlfriend of Chris (see his ink here) with whom I served a brief stint of jury duty over the summer. When December 4 rolled around, everything went smoothly. 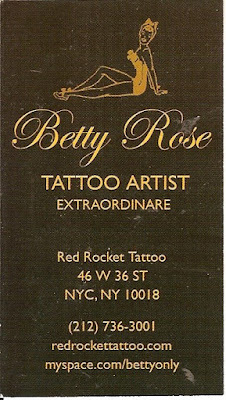 Betty Rose had lifted the signature from the old ssocial security card that Mary-Lee still had in her possession, enlarged it, and placed the stencil in the perfect spot on the first attempt. She is very pleased with how the nuances of the signature were picked up in the process, and loves how the inked reproduction is tilted "upwards, toward heaven". 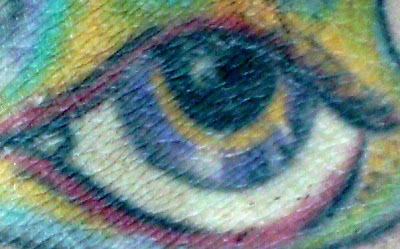 And, whether it is the physical fineness of the lines and minimal surface area the tattoo affects, or whether there is a paternal heavenly influence with its hand in the process, Mary-Lee has marveled that she has experienced none of the typical symptoms that come with a healing tattoo. 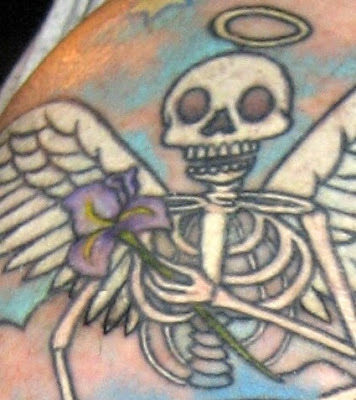 This lack of self-consciousness about the ink, combined with the minimal pain and aftercare required, has validated for her the transcendent healing nature of her tattoo. And it has helped her obtain another level of closure that she never received when she lost her father at the age of eleven. 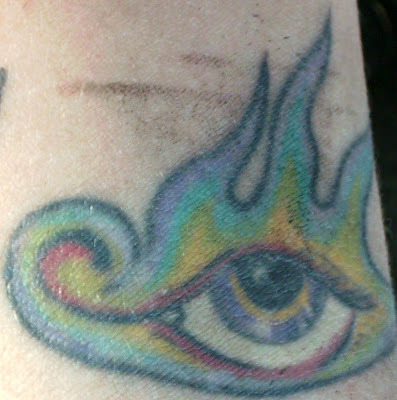 Thanks to Mary-lee for sharing her tattoo and its story here with us on Tattoosday! I spotted this patriotic and paternal piece earlier this week at Penn Station. 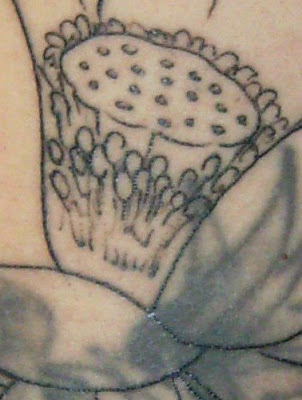 Jeremy explained this straight-forward tattoo, which is inked on the inner part of his left bicep. 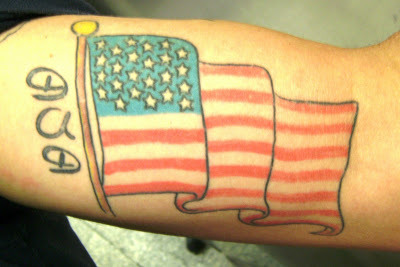 The design is a tribute to his father, who died on the 4th of July, 2001. Dad had served in the U.S. army in the Korean War and it seemed fitting to Jeremy, who has six tattoos in all, to honor his memory with this piece. 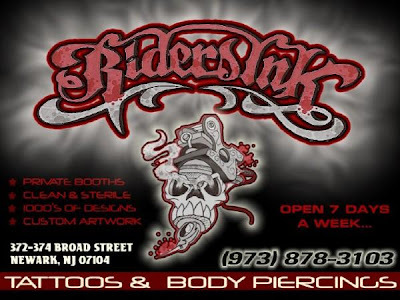 The tattoo was inked at Bob's Crystal Blue Tattoo & Body Piercing in Shirley, New York. Thanks to Jeremy for sharing this tribute to his father with us here on Tattoosday! This is based on a limited edition print of the comic book character, Hellboy. 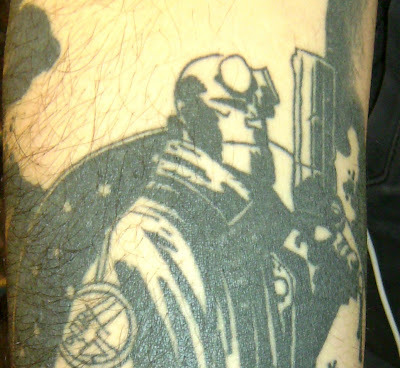 Daniel is a fan of Mike Mignola's creation, one of his favorite comic book characters, and he acknowledges that he's "a bit obsessed" with Hellboy. His hope is to eventually devote an entire sleeve to him. Note the detail on the edges of the panel. This just wasn't the character, but the edges of the piece look as if ripped directly from a comic book panel. 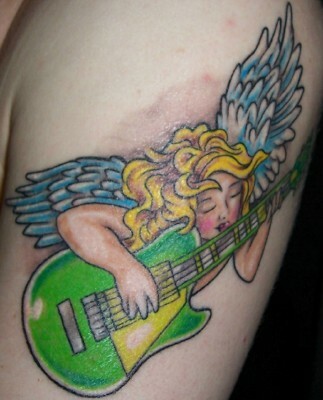 This was inked by Simone at Rising Dragon in Manhattan, when it was still on 23rd Street. Daniel estimates that this finely-detailed piece took about four and a half hours of work to complete. Work from Rising Dragon has appeared previously here. Thanks to Daniel for sharing his Hellboy ink with us here on Tattoosday! 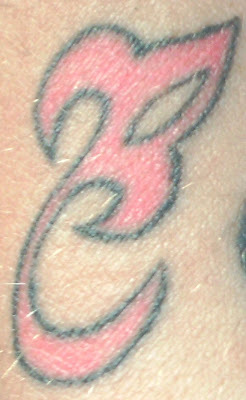 An unseasonably warm Monday, when the temperature rose above 60, proved to be a bonus here at Tattoosday. 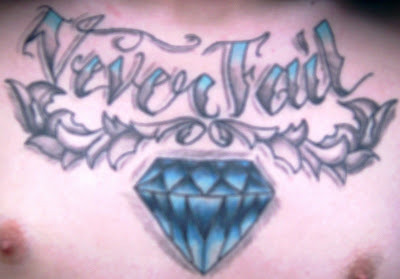 I was struck by the diamond in the middle of the chest, which reminded me of the piece in the Tattoosday banner at the top of the page. Mike told me that the message "Never Fail" was a reminder to himself to always strive to achieve his goals, to do the best that he can, and to never fail. The piece was tattooed by Sean Foy at Rider's Ink in Newark, New Jersey. 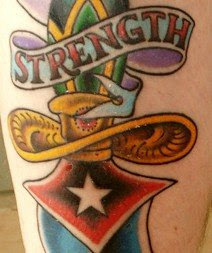 Thanks to Mike for baring and sharing this self-motivating message here on Tattoosday! 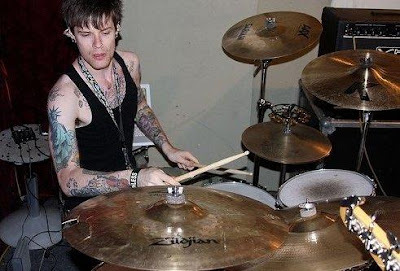 One of the benefits of Tattoosday is that, because musicians tend to have a lot of ink, I meet a lot of them, and learn about bands that I may never have heard about. This past Friday, I met Camille (pronounced Cah-mee) outside of Penn Station and he showed me a couple of his tattoos. Camille is the drummer for the band TV/TV (MySpace here). They just released their 5-track EP Something to Get Excited About this past year (read a review here). 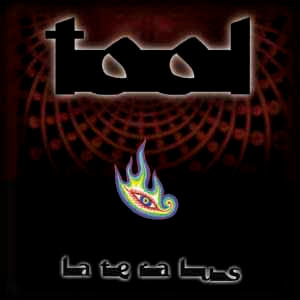 I've heard several of their songs since then, and I've enjoyed their sound (see the bottom of the post for more info). TV/TV is playing at the Highline Ballroom on January 15 and are booked for the Warped Tour in the Summer of 2009. 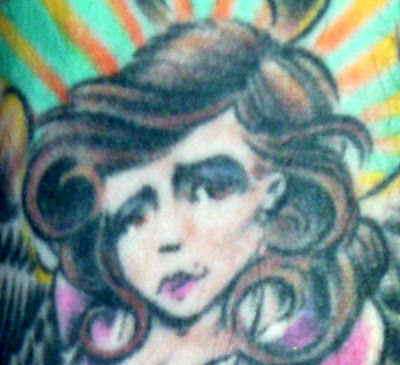 On the day the world mourned the passing of Bettie Page, it seemed appropriate to get a shot of a pin-up tattoo. This piece is a vision, like many pin-ups, of the wearer's "dream girl". The top caption, "Isn't She Lovely?" is a nod to the Stevie Wonder song (his "favorite song ever"). Camille notes he's a big Stevie fan. He says it's not obvious from the piece, but the woman has a knife behind her back, which explains the warning "Trust No One". See another version of this motif, appearing previously on Tattoosday, here. He added these to his arm because he loves the theater and musicals. Both tattoos are on his left arm. The comedy/tragedy masks are on the inside of his wrist. 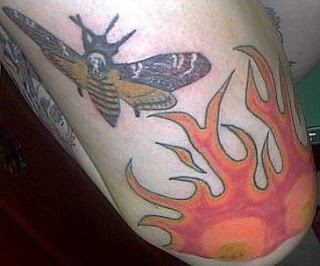 The artist on both pieces were inked by Turk at Guru Tattoo in the Pacific Beach section of San Diego. 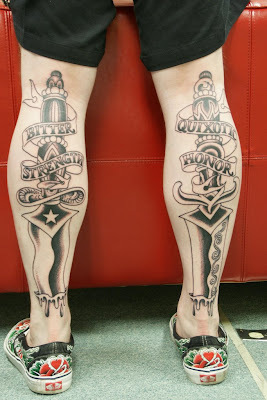 Thanks to Camille for sharing these tattoos here with us on Tattoosday! 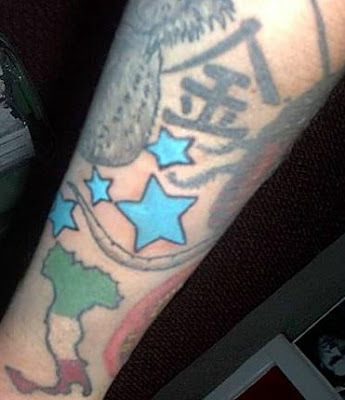 A couple of weeks back, I posted some ink from a guy named Tom (here), which featured the trinacria of the Sicilian flag. The above example, from our good friend Fabiana (see her last post here - which links to her previous ones, as well), is a more colorful and elaborate take on the design. 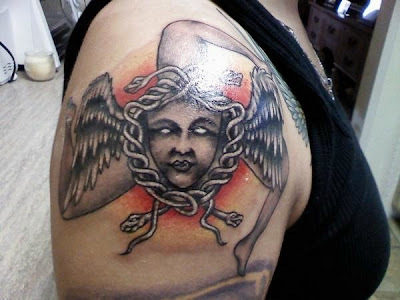 "The tat of the Medusa head I got because it's on the Sicilian flag. I was born there and it reminds me of all that I left behind, kinda just reminds me of my fam there and the time I lived there and all the things I went through! I love Sicily! It's such a beautiful place, hope I can return there some day! So now I look at it and it takes me right back to where my life first began." This piece is on her upper right bicep and, like most of her work, was inked by Lou at Third Eye Tattoo in Brooklyn. "The other new one I have is the orange one that kind of looks like a card. I got that because of my ex-girlfriend. I used to say to her 'I love you to the moon and back and all the stars in the universe.' So because of that, I got a moon and seven stars with the color orange because that was her favorite. She meant a lot to me but things just didn't work out. I will love her always!" Yet again, a hearty thanks to Fabiana for letting me post her ink here, and for sharing the deep personal meanings behind the tattoos. My recent affiliation with Nathan over at KnuckleTattoos.com has been fairly sparse with the cold weather seizing the Northeast. However once he added me as a contributing writer, I queried about him sending me photos of some of his ink to put up over here on Tattoosday. This post reflects a couple of leg pieces he sports. These pieces were inked by Jason Brooks ("he is incredible") at Rock of Ages Tattooing in Austin, Texas. So I went under the gun again. First time in almost six years. I was just supposed to get the outlines done, but then his appointment after me canceled and I got a four hour session. The crook behind the knee and the area around the Achilles tendon were miserably painful, but the rest was pretty tolerable. The theme behind the piece is a warning about virtues bordering on being vices. Values that can bite you back. Just because I am strong enough to endure hardship does not make it any less hard. Sometimes not bearing the load is better than having the strength. 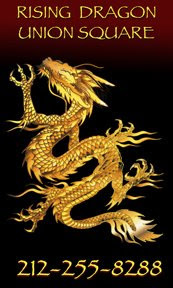 Honor is good up to the point that it becomes pride or self delusion. Of course it also works backwards. I am strong enough to persevere. Sometimes the windmills are dragons in disguise. Thanks from Us Here at Tattoosday! On Thursday, December 4, at 4:31pm E.S.T., Tattoosday logged its 100,000th hit. which is from one of my favorite posts ever. If you have become a reader since last May, I encourage you to go back and check out that post. Regardless, thanks to everyone who has visited since Tattoosday's inception. 100k is nothing to sneeze at. I wouldn't keep doing this if it weren't for the people checking in on a regular basis. The previous post featured the "Eld Sigul" insignia attributed to Stephen King's Gunslinger, of The Dark Tower series. 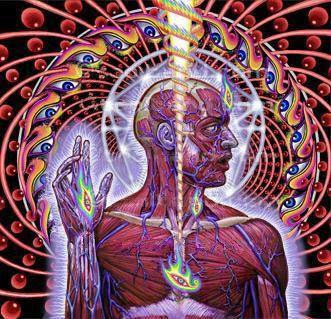 As I had mentioned, I was able to locate the artwork on which this earlier tattoo was based, but the specific source of the new design eluded me. So I popped into the local Borders and, after wandering a bit, found the Horror section wherein the King books resided. I perused the covers but, alas, no sign. I was about to leave when a store employee named Jill popped up and started straightening books next to me. So we got to chatting. She has seven pieces in all, three of which I saw. She has designated a theme for each of her arms and legs. I had noticed the pin-up on her right forearm first, which turns out is her Celtic-themed limb. She isn't happy with the red in the dress, so that piece is technically a work-in-progress. Her left arms sports some kanji, as part of her Asian-themed limb. I love how the octopus is staring out the eye socket of the skull. It's an amazing effect. Thanks to Jill for sharing this awesome piece with us here on Tattoosday! Here's hoping she'll be back on these pages for a return engagement! Autumn has not been good to us here on Tattoosday. Inkspotting has been, um, spotty, at best, and most of the work I have seen has been indoors and/or below ground. On Tuesday, I glimpsed some color peeking out from a woman's sleeve as she walked south on Seventh Avenue. Karen is a student at Fashion Institute of Technology and was inky of another sort, with smudges on her hands and arms from her projects. She is an artist specializing in textile surfaces, designing such things as wallpaper, tissue boxes, and other items requiring her craft. She cleaned some of the ink up from around her body art, enough so we could get a clearer shot of her tattoos. The one on the left is the insignia from the Gunslinger's revolver featured on the covers of Stephen King's Dark Tower series. 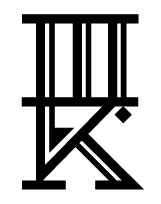 This is referred to as the "Eld Sigul" insignia and stands for the Gunslinger. I'm sure fans of the series will correct me and/or expand on the topic should they find that explanation lacking. Do note that we had a Dark Tower tattoo recently on these pages, here back in October. What's noteworthy about this piece is the ink used has special qualities. Karen originally wanted a hot pink tattoo, but the shop (Skin Deep Tattoo) had just received a shipment of ink that illuminates under black light. 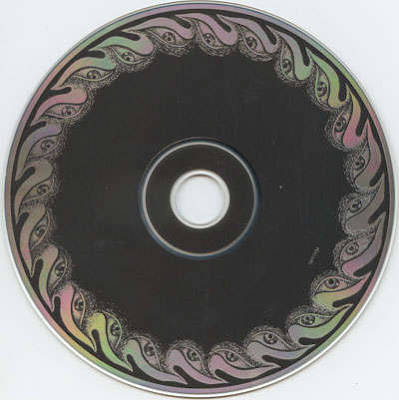 I've not seen one of these in person, but have seen samples elsewhere in the blogosphere. This, also, was worked up at Skin Deep. 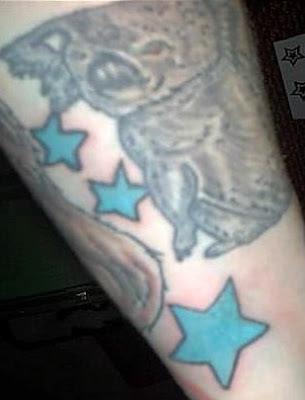 Karen believes that Rob was the tattoo artist for both pieces. The extreme close-up at the top of this post emphasizes how vivid the ink used in the piece is. Karen has two other tattoos, but they were well-protected from the elements, and were not visible higher up on her arms. I do thank her again for being so amenable to stopping and sharing her work with us here on Tattoosday!